Why does the artist formerly known as Zimmerman still matter after almost 50 years in the business? His current affairs may provide an answer. There’s the Academy Award for Best Song in 2001 (“Things Have Changed”); there’s the book Chronicles Vol. 1 that rode the best seller lists a couple of years ago; there’s the weekly satellite radio program where he plays a DJ and spins eclectic vinyl. There’s also the legion of fellow travelers. Just two weeks ago in Nashville at the Ryman Auditorium, the singer/guitarist Jack White popped up unannounced and joined Dylan onstage. But I found my answer when looking at the set list from his gig this week in Worcester, Mass. He’s always on tour worldwide, and this show got rave reviews, with a solo Elvis Costello as opening act. What struck me was that of the 16 songs by Dylan and his band, six were from his latest work Modern Times, which made its debut at #1 on many global music charts last year, including America. Two other songs were from the CD before that, Love And Theft, which was released on 9/11/01 and got lost in the shuffle of more pressing events. That’s right: a full half of the songs in Worcester were recent material. Dylan has always pushed his latest songs in concert. If ticket buyers aren’t familiar and expect an oldies act, forget it. Hey, the guy knows retail….you slash the cost of the old threads and push the new stuff. Of the other eight songs he did that night, two of them were decidedly obscure, leaving six songs that might be considered reasonably well-known to drive-by fans. He has almost 500 to choose from, of course, and they’re frequently interpreted by singers from jazz to metal. But on top of that, many of his classics now have different musical arrangements, and his concert vocal style — to put it charitably — is rougher than it was a generation ago. So even words and music one supposedly already knows may sound nothing like the original when he performs live. This makes him bewildering to some concertgoers and reviewers (particularly if far from the stage) and explains the outright hostility some exhibit. They are insulted that he’s not living up to their preconceptions and expectations. Right…like he’s never dealt with that before. All of which is why Dylan remains vital in the 21st century. His band positively smokes on stage, and that certainly helps, but anybody who’s frontloading new material in concert after damn near five decades, while totally deconstructing their big hits of the past, is artistically vital by any definition. Read the New York Times Magazine cover story here and here. 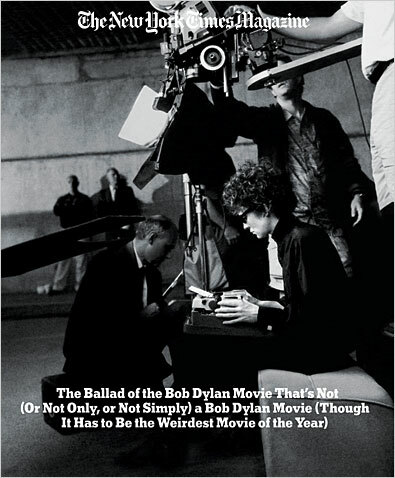 BB NOTE: I have reservations about this film, namely that what makes Dylan so interesting, even so American is not that it has anything to do with the reality of who the man really is (in fact, one walks away from his book Chronicles with more questions than answers), but more about what others bring to him. He is more like an artist’s canvas, sitting on the easel waiting, a canvas that also provides the painter the oils on which to paint their personal masterpiece, not his own. It’s about the other – or is that Other? In real life, he’s probably really boring, going on and on about baseball while riding a bus. Does he e-mail? Does he own a cell phone? Is he still using a manual typewriter or does he have a Powerbook? He hates getting his picture taken and has thugs snatching cameras all through his concerts, especially lately (it’s bizarre). Who knows? His world is in the interior. He’s right to tell people to get a life. Dylan is the soundtrack, not the subject. The point is not to be so serious. After all, it’s rough out there. High water everywhere. Put on your boots and shoes.